In a small farming town, mailman Otis P. Hazelrigg (Charles Durning, The Muppet Movie) hates Bubba Ritter (Larry Drake, Darkman), a developmentally disabled man. Hazelrigg particularly can’t stand to see Bubba play with Marylee Williams (Tonya Crowe). When Bubba shows up at the Williams’ door with a bloodied Marylee in his hands, the town fears the worst. Without waiting for the Sheriff, Hazelrigg gathers a posse of his own, and drives to Mrs. Ritter’s (Jocelyn Brando, Mommie Dearest) farm. Mrs. Ritter has already sent Bubba out to play the “hiding game”, but Hazelrigg’s friend Skeeter Norris (Robert F. Lyons, Deathwish II) brought along some dogs. 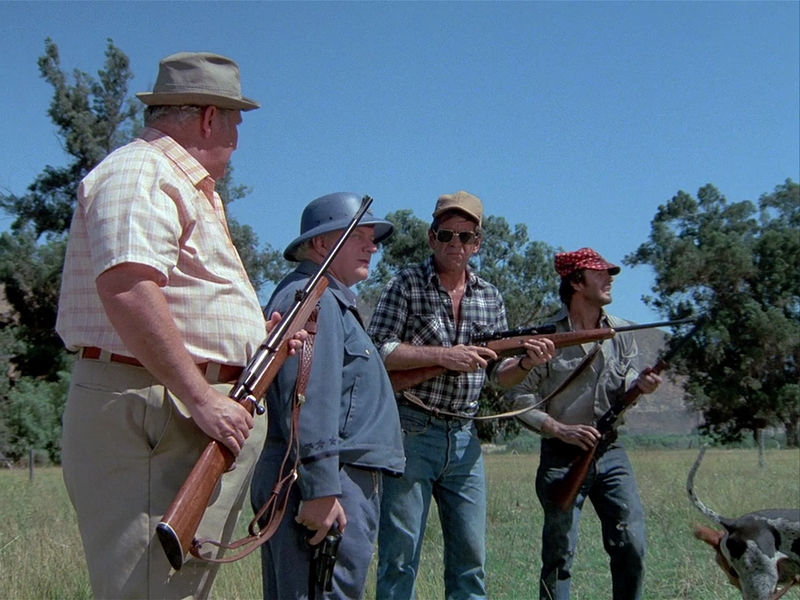 They find Bubba, who’s dressed himself as a scarecrow in Mrs. Ritter’s field. The men shoot him 21 times, only to get a call from the sheriff: Bubba didn’t heart Marylee…he saved her from an attack by a vicious dog. Hazelrigg puts a pitchfork in Bubba’s cold dead hand and manages to intimidate the others into going along with a self-defense story that holds up in court. Of course, there are other sources of justice in this world, and, as Halloween approaches, the men die one by one, each seeing the scarecrow again before they die. Who is behind the murders…and can Hazelrigg figure it out in time to save himself? There are some movies, at least for me, that have just always been. As far back as I can remember, I can remember them; I don’t really recall a first time I ever encountered them. Somehow Dark Night of the Scarecrow is one of these. I can recall seeing it seemingly every fall when I was young, on the background, usually, or I’d see just enough to decide it was too scary (or talky) and I’d stop watching it. 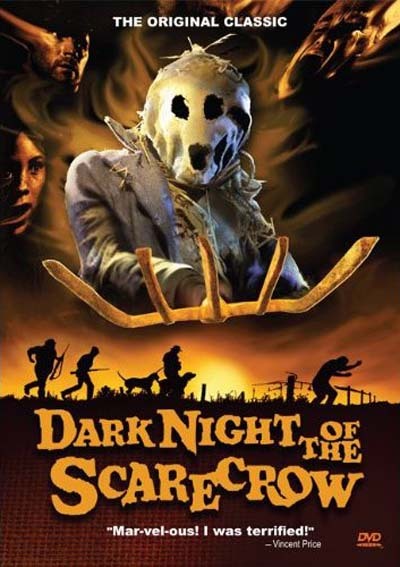 Dark Night of the Scarecrow came out during the tail end of the glory days of Made-for-TV-Movies, when they were often lower budgeted version of films you might see released theatrically (though of course the “release failed pilot episode(s) as a TV movie” scheme still happened, even then). These days the format is generally identified with “Lifetime” and “Hallmark” movies, but through the 1980s and into the early 1990s genre movies were still being made for network television. Simple Jack II: Die Simple Jack, Die! 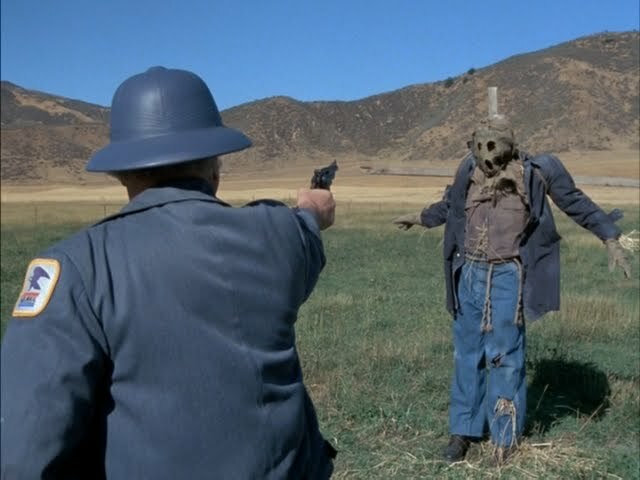 Dark Night of the Scarecrow stands with some of the darkest of the TV movies, considering it features some fairly gruesome (if mostly implied) deaths and a strong, creepy performance from Durning. Durning’s mailman is a petty tyrant* with a group of weaker willed enforcers that help him harass and murder a harmless and helpless man. It’s interesting to note that he himself seems to be more than a little sleazy, and one must wonder if his suspicions about what Bubba must be up to with Marylee aren’t a reflection of his own desires. Helping the film along are the absolutely creepy moments with the scarecrow, especially those when he moves suddenly, which surely gave many a youngster nightmares. 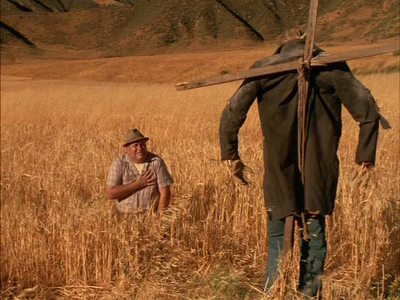 There’s a nice build to the scarecrow’s revenge, wherein he appears in each farmer’s field, then lures them to gruesome deaths at the hands of their own equipment, all accomplished with nighttime location shooting that looks fantastic. 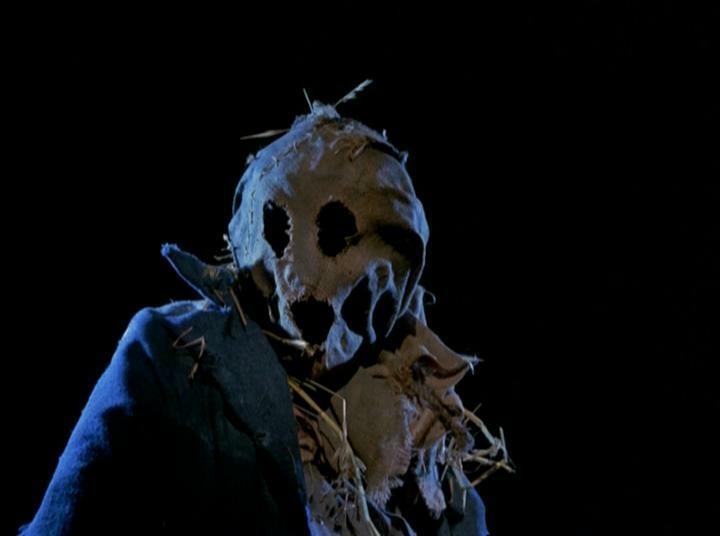 Which isn’t to say that Dark Night of the Scarecrow doesn’t bear some marks of its origin as a TV Movie. Many of the supporting actors are firmly in TV territory, and there is definitely some padding which keeps the film from truly building up the atmosphere it would need to be a top flight movie of its type. 1981 was smack dab in the middle of the first slasher film explosion when those movies were soaked in blood and featured menacing, but rarely supernatural, killers. While it could be argued that this film owes a debt to the slasher films of the era (seasonal setting, some of the style used), the film is really a throw back to older horror films: revenge from beyond the grave and ghost stories, with little blood shown and the emphasis on the men slowly realizing that something is coming for them. There’s also a bit of the classic “is this really the supernatural, or is it all a trick” dodge used for ages to deal with censors. That trope was long out of favor in theatrically released films, but it seemed like every time the supernatural reared its head in TV movies and TV episodes there was a good chance that, in the end, it would all be revealed to be a trick. Here, ultimately, there is no trick; Bubba comes back from the dead to effect his revenge, but during the buildup there are hints that perhaps his mother has something to do with it, while the men all assume it is a real person taunting them. 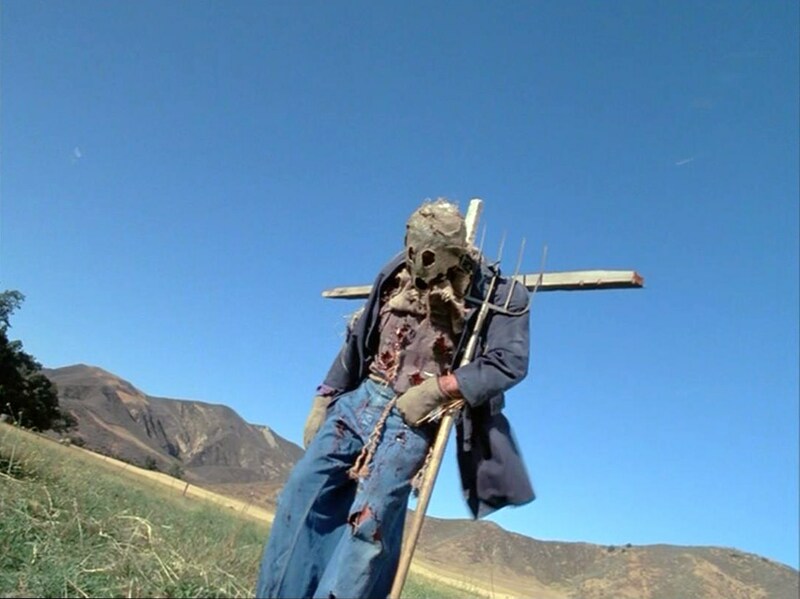 While showing it’s origins as a Made-for-TV movie, Dark Night of the Scarecrow is an effective, and at times atmospheric horror/revenge film that is worth a look for fans of the genre. *While watching this all I could think of was the mailman turned tyrannical drill sergeant from All Quiet on the Western Front. Is it the uniform and rules and regulations for a non-military occupation that does it? 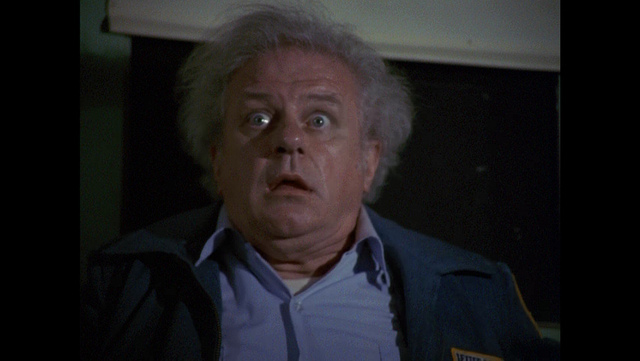 This entry was posted in From Beyond the Grave, Full Reviews, Ghost, Horror, Made for TV, Revenge, Reviews, Slasher, Thriller and tagged before they were famous, Charles Durning, Claude Earl Jones, courtroom scene, developmentally disabled, farmers, Frank De Felitta, Halloween, Halloween party, J.D. 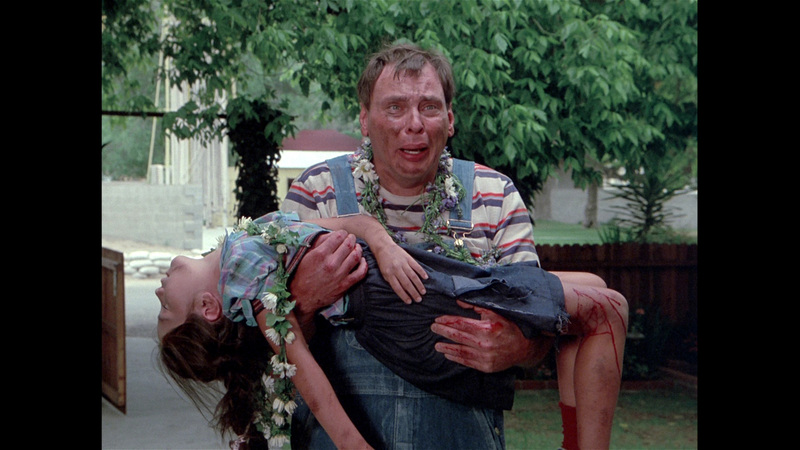 Fiegelson, Jocelyn Brando, Lane Smith, Larry Drake, mailman, overalls, Robert F. Lyons, scarecrow.